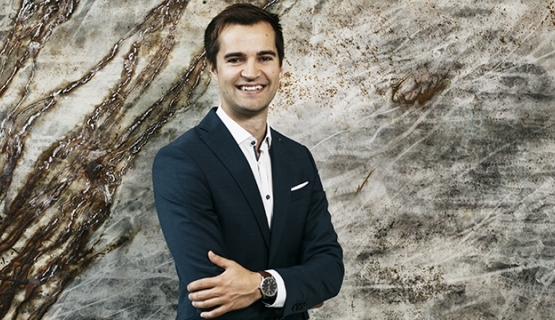 Aalto MBA Journal will be following Kai Rönnberg’s studies until his graduation. Over the next year and a half, Kai Rönnberg will be giving regular updates on his studies, as he reflects on interesting, amusing, and also difficult moments along the way in these interviews for Aalto MBA Journal. His aim is to graduate at the in spring 2018, but there is still plenty to do before hitting that milestone. Studying definitely energizes! Kai Rönnberg is quick to sum up when asked whether it is hard to embark on his MBA studies after a long day at work. After a working day, I feel good about going off to study. At the moment, Rönnberg has six months of Aalto MBA studies, seven modules, plenty of brainwork, discussions, formulas, and writing behind him. Sitting in lectures has clearly left him revitalized. Over the next year and a half, Kai Rönnberg will be giving regular updates on his studies, as he reflects on interesting, amusing, and also difficult moments along the way in these interviews for Aalto MBA Journal. His aim is to graduate at the end of 2017, but there is still plenty to do before hitting that milestone. Rönnberg is currently Vice President, Services Beneficiation Business Line, at Outotec. The 34-year-old already holds a Master of Science (Technology) degree from Aalto University, and has gained plenty of work experience, specialist training, and responsibilities in the mean time. In addition to 25 people under his direct management, he has significant business responsibility. With the increase of demanding tasks, Rönnberg felt he would benefit from additional knowledge, and decided to mention the prospect of studying in his development discussion. He carefully considered the plan and timing with his managers, until the situation at work seemed fitting last year. The first thing to do was to choose the right place to study. He compared his options, went to interviews, and even visited similar schools in Copenhagen and Stockholm. The reputation and offering of Aalto EE seemed to have the most weight, and the next thing was to compare the EMBA and MBA programs. Rönnberg went for the MBA in the end: I wanted to improve my business skills, and the program offers exactly the courses I need. In addition to learning new skills, the last six months on the Aalto MBA program have already highlighted other perks: group work, discussions, and a strong bond between the programs 24 participants. The Aalto MBA group has two coordinators, or presidents, who also arrange plenty of leisure time activities; so far the students have celebrated, done some rowing, and visited different companies. Rönnberg is looking forward to the group increasingly challenging each others thinking, and, as the studies progress, also networking with students from other courses. Each MBA student is asked how they balance work, studies, and their private lives – something all of the participants have faced when staring at their calendars. According to Rönnberg, apart from having less time for friends at times, and playing badminton with his own team before the workday begins, he has enough time for a fairly normal life and for his girlfriend. Of the courses arranged in the spring, especially the Strategic Human Resource Management module made an impression. During the lectures, different types of managers and management styles as well as their impact on corporate HR policy were analyzed. According to Rönnberg, from now on he will be looking at the operating methods of his own company with a different perspective and understanding. Following the Financial Accounting and Management Accounting modules, Rönnberg was inspired to draw up a proposal for a new profitability calculation model for his workplace, which has since been adopted and proven to work well. Combining work and study is a source of inspiration, and Rönnberg has some words of advice for professors with a particularly theoretical approach to subjects: If I take part in a business-related MBA program, Id like it to also be connected to corporate life. Rönnberg thinks that using topical practical examples as a basis has been a strongpoint of many of the modules. Following the core modules, during the fall the Aalto MBA students need to choose an area of specialization between Applied Finance and Accounting, Entrepreneurship, and Managing Innovation and Renewal. Rönnberg is still weighing which option will benefit his own work the most. These Aalto MBA Journal reports will keep you updated on what he goes on to choose, and how his studies advance during the fall. Rönnberg has clear expectations for the fall: courses of a high standard, interesting professors, diverse groups, lots of discussions, and new, concrete lessons. He is ready to invest as many as 60 hours per month into studying. In the next section of the Aalto MBA Journal, we will be talking about the employers role and interest in the MBA program, as Kai Rönnbergs supervisor, Ari Numminen, explains Outotecs goals and expectations as the studies progress. But for now, heres to early-morning badminton sessions, and studies that offer the right amount of challenge!